Fans attending the first day of WonderCon (Friday, April 1) will be treated to a special “Green Lantern” talent signing and panel featuring the stars of the upcoming Warner Bros. Pictures feature film: Ryan Reynolds, Blake Lively and Peter Sarsgaard. The signing begins at 4 p.m., followed by the panel discussion at 5. The highly anticipated “Green Lantern” movie — in theatres June 17, 2011 — will be the first live-action feature film to star the popular DC Comics character. 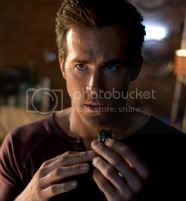 The film relates the origin story of alter ego Hal Jordan (Reynolds), a test pilot and the first human chosen to wear the ring that provides him his superpowers. Following the opening day panel, Hal Jordan and the Green Lantern Corps will have a deep and diverse presence throughout the weekend due to the combined efforts of DC Entertainment (DCE) and the various divisions of Warner Bros. Entertainment, including Warner Home Video (WHV), Warner Bros. Interactive Entertainment (WBIE) and Warner Bros. Consumer Products (WBCP). WHV will present the World Premiere of the Blu-ray and DVD feature “Green Lantern: Emerald Knights” on Friday evening in the Esplanade Ballroom, immediately followed by a panel discussion featuring filmmakers and voice cast members. Panelists will also take part in an autograph session on Saturday. The all new DC Universe Animated Original Movie weaves six interlocking stories of the Green Lantern Corps’ rich mythology around preparations for an attack by an ancient enemy. Also on Friday, DC Comics will host a panel about the Green Lantern comic books and the 2011 War of the Green Lanterns crossover event. The DC booth will host Green Lantern-themed signings and giveaways throughout the weekend. WBIE and DCE will showcase “Green Lantern: Rise of the Manhunters,” an action-adventure videogame that will be available in conjunction with the theatrical release of “Green Lantern.” Throughout the Con, visitors to the DC Comics booth will be able to get hands-on time with the game that delivers an immersive experience for Green Lantern fans of all ages. WBCP’s worldwide licensing program for the highly anticipated “Green Lantern” film has already taken the industry by storm. Product manufacturers around the world have come together to capture and unleash the power of Green Lantern, who lit the way at this year’s Toy Fair, with master toy licensee Mattel bringing to life a comprehensive toy line inspired by the upcoming film. Visitors at WonderCon will get a sneak peek of the toy line, along with the opportunity to be “chosen” to win some of the popular products, long before they hit retail shelves. All this and more begins with the “Green Lantern” signing at 4 p.m. and panel at 5 p.m. on Friday, April 1, 2011. WonderCon opens the doors to the main floor at noon. The event runs all weekend, through Sunday, April 3, at the Moscone Center in San Francisco. Go to www.comic-con.org/wc for tickets to the “Green Lantern” opening day panel and for information about all of the Warner Bros. and DC Entertainment-related events. Sounds like a great event! Wish I could go.